Everything I put out seems to been seen by next to no one. I have 8630 Twitter followers. One person saw a thread I wrote. Do algorithms tamp down critics of social media websites? Since the tweet thread I wrote today was liked by one person, it must have sucked, right? It boiled down to this: Lower tax rates have never raised wages. Not once for working people over the past 40 years. Why? The question was brought about by Stephanie Ruhle on MSNBC who pointed out Europe has lower corporate tax rates, but their economy is not improving. In fact, Germans are so upset about their flat wages, they are starting to turn to white nationalism, too. There is another theory out there about how to fix the economy. The other theory is that instead of giving corporations more money — again — we should arrange the tax code to give more money to the poor and middle class so they can buy things. The reason the retail sector is dead is no one can afford to shop. Do you think that is a boring thread? Perhaps so. I think it is an idea worth discussing, especially since propping up the middle class through better tax policy instead of propping up the rich through changing tax policy is better economic policy. So why did the thread go nowhere? The time of day? It was morning. Maybe everyone was working. Hmm. That doesn’t seem likely. There were plenty of morning viral tweets. Is this because it was obnoxious and hard to get behind? You tell me. What I think is more likely is my criticisms of various social media platforms has gotten be blackballed. Why did my good friend who lives locally and reads my stuff tell me she wasn’t seeing me anymore on her Medium page? Why are my Twitter threads going unnoticed? If you criticize the spread of white supremacy on the websites, suddenly your stats go down. So, you won’t see this, but I may as well try. She was suspended after reporting to the Senate Intel Committee that Twitter put her on limited view status, which must be what I was on. 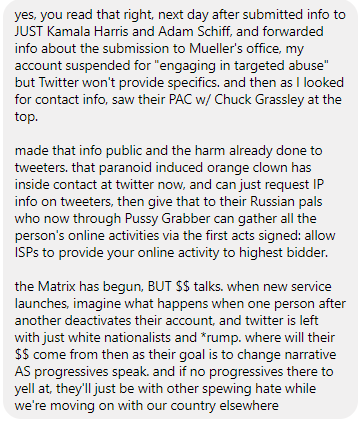 This is her suggestion for social media for progressives. I disagree. I think we should use each form of social media to speak out. Unless and until there is an alternative, we have to be able to tell this story. 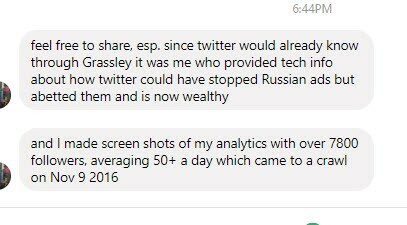 If people want to see screen shots of her analytics, let me know in the comments. I don’t know what kind of evidence people need. Update: After posting this story, within minutes, my account on Twitter was suspended. I complained about this loudly on Medium and on Facebook. A short while later, I was able to tweet again. I feel like I watched freedom flicker on and off today. But that was my freedom. My friend, a long-time member of #blacktwitter is still suspended. I checked back on the stats for this story breaking my “never check stats” rule. 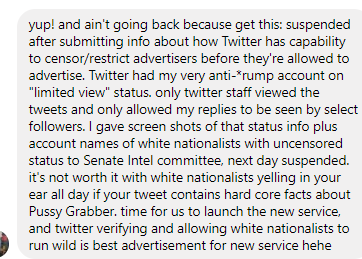 Seeing that people had seen this article but were indifferent to this concept of limited view status that tweeters could be under without their knowledge. This made me feel like I was back in my Tuse of Nazism class and I was hearing my professor explaining why it happened. Indifference. The two names who stuck out from this list were Chuck Grassley and Bob Goodlatte. Both of these men have been working double time to derail the Russia collusion investigation. Just sayin.